Today's Draw: Six of Swords from the Steele Wizard Tarot in the What to Use in the Future as You Move Toward Your Goal position from the Deck of 1000 Spreads. Is there some attitude or recurrent thought that you find constantly gets in the way of your goals? Are you responding to something, rather than acting from a place of genuine power? Are you ready to lay all that down and find your true source of balance and power? 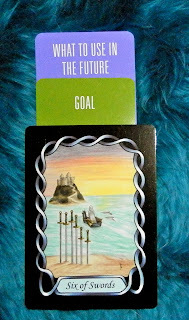 In the Six of Swords, we see a woman leaving conflict and issues (swords) behind and moving on to a better place. Dolphins guide her journey, signaling more peaceful times ahead. She's not abandoning her previous situation. She's merely moving on...without looking back. While I believe in assessing situations to take your lessons, lessons often reveal themselves better from a distance. And the easiest way to reach our goals is to lay down our swords and move forward. In fact, it's the only way. This isn't just about interpersonal conflict. It's about any issue. Let's say you got fired from your job. Your goal is to get another, much better job. But that will be harder if you're suing your old place of work. It will be harder if you bring resentment and a "I'm out for myself" attitude to the next job. And, if you're paranoid that the same thing will happen to you again, it probably will. All of those things are reactions. They're actions and attitudes you take in response to another's actions. And as long as you're reacting to what has happened before, you're not acting on your goal. I've been putting a lot of thought into action vs. reaction lately. I think one of the harder—and most essential—parts of our spiritual growth is to act genuinely. By that, I mean to act the same regardless of external stimuli. If you're non-violent, be non-violent even if someone pushes you. If you're into oneness, then see yourself in your enemy, not just in your friend. In other words, act unconditionally. Now, there are some non-violent people who will die from being unconditionally non-violent. So the practice may be sometimes more of an ideal. But this kind of unconditional action is the only true source of power. Because each time we act in response to something, we give up our power to whatever it is that's pulling our marionette's strings. Usually we do this by getting caught in the drama (or the excuse) of something that happened to us...or something we did to ourselves. I had a boyfriend once that was a professional athlete at one time in his life. And he blew it. He could have worked harder, but he didn't. He drank and messed around with girls and then spent the next 20 years or more drowning his regrets in alcohol. He acted in response to a bad mistake on his part and lost all his power. In doing so, he wasted much of his life with regrets and getting revenge on himself. His way out might have been to unconditionally pick himself up after he falls...or unconditionally forgive himself for being human...or to move forward and unconditionally focus on his goals despite distraction. See, where I'm going? It's a way of becoming "bullet proof" that doesn't come out of defiance or trying to prove yourself to someone. It's just an agreement you make to yourself to not give your power over to something you cannot change. If I look back on my own life, I can see times where I've held onto something for way too long...a relationship that ended poorly and a conflict that was very hurtful to me, for example. When I realized I had a hard time letting go, I worked on letting go, not to spite the other party, but to become more unconditionally centered in my own power and balance...to take things less personally and focus on what *I* think of me, more so what others think of me. Which isn't to say I don't still struggle. But I lose much less power, balance and time on it than I used to. But I also noticed something else. When I moved away from losing my power to others, I found myself losing power to myself. Like the boyfriend, I found myself responding to my own "dropping of the ball" in a particular situation and fixated on that, instead of starting over fresh and just moving forward. So we do it to ourselves in many ways. And it can be something as old as childhood bullying getting in the way of adult friendships, you know? We let a bunch of noise come in to distract us from our goals, whether it's self-pitying, defiant, righteous, proud, fearful, angry, regretful or whatever. It's all reacting. And it takes us away from acting from a place of power in the pursuit of our goals. So think about the goals you've set for yourself in life, whether they be spiritual, career oriented, relationship centered, personal or whatever. What noise is in your head that may be slowing you down? What are you spending your energy responding to? Becoming conscious of these things is the first step toward taking your power back and developing an unconditional way of being that enables you to focus on your goals...regardless of what happens. Make decisions for yourself long before the stimulus comes along for you to react to. It's time to lay down the swords of reaction and sail on to a new phase of life where you're acting from a place of internal integrity and are far less subject to the whims of outside forces.